P22 Marcel is a new script typeface from P22 in the tradition of the P22 Cezanne and P22 Dearest typefaces. Marcel is available as a basic font or as a Pro font with over 1300 characters packed with OpenType features. Marcel was also chosen as one of the distinguished faces awarded a prize from the TDC typeface competition. The font Marcel is named in honor of Marcel Heuzé, a Frenchman who was conscripted into labor during World War II. During the months Marcel was in Germany, he wrote letters to his beloved wife and daughters back home in rural France. 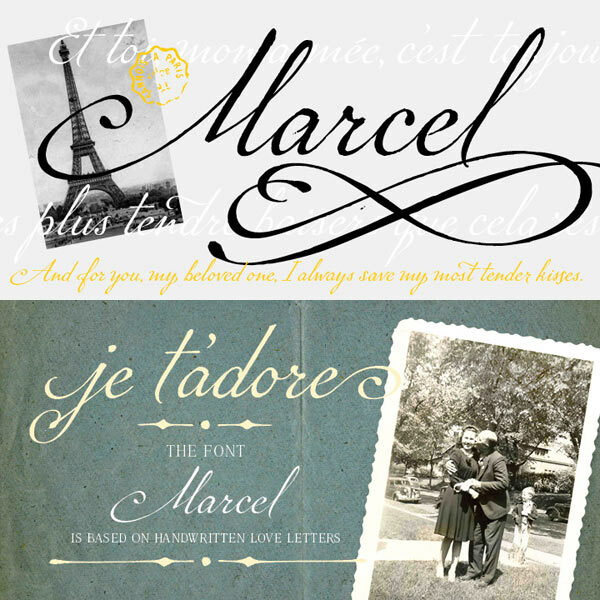 Marcel's letters contain rare first-person testimony of day-to-day survival within a labor camp, along with the most beautiful expressions of love imaginable. The letters—stained and scarred with censor marks—were the original source documents used by designer Carolyn Porter to create a script font that retains the expressive character of Marcel Heuzé’s original handwriting. Carolyn spent years on the design and taking the project even further, translating the letters she found and eventually contacting the family. Along with the main Marcel typeface, there are two fonts featuring historical post marks and inspector marks plus a roman titling font designed to accompany the script. A more comprehensive backstory on the making of this P22 Marcel is featured on our Behance page and is featured on Print Magazine's Daily Heller collumn. This content has received so many articles on detective stories and love stories. The details are really much important to have australian writing reviews and assignments. Then everyone will be lucky to read and follow their essays.